Today Maynooth is primarily associated with Maynooth University and Saint Patrick’s College, and the dominant architectural features are Pugin’s college buildings and McCarthy’s college chapel. But Maynooth, Co Kildare, is also an elegant Georgian town, with planned streets, squares, public buildings and townhouses that owe much to both the benign interest and patronage of the FitzGeralds, Dukes of Leinster, and the prosperity brought by routing the Royal Canal through Maynooth. Maynooth is on the Royal Canal, which is navigable from central Dublin to this point. Although it is now used mostly for leisure purposes, the Royal Canal once provided an important stopping point before Dublin in the period directly before the coming of the railways to Ireland in the first half of the 19th century. The harbour, known locally as Duke’s Harbour, is roughly triangular in shape and on the north side of the canal, opposite the railway station, and it is a popular fishing area. Leinster Street, named after the Dukes of Leinster, links the college gates, the old castle and the Main Street with Duke’s Harbour. The former Church of Ireland school on Leinster Street which is now a scout den, the former RIC barracks which is now a Garda station, and the surviving Georgian townhouses on one side of the street indicate that this street was once at the heart of social life and fashionable living in Maynooth in the late 18th and early 19th centuries. But the visitor has to look for these buildings, and this search is not helped by the presence of a large and ugly car park that occupies much of the west side of the street. 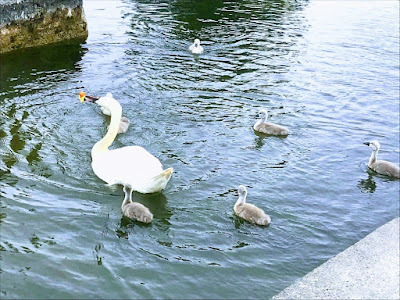 On our way back to Askeaton from Dublin at the weekend, two of us stopped in Maynooth on Saturday afternoon, where we spent time enjoying the presence of a pair of swans and their family in Duke’s Harbour, before making our way back to a family lunch in a restaurant on the Main Street. I knew many of these streets in Maynooth as a theology student and church history researcher in the late 1980s and early 1990s. But I had often passed by Harbour House or Bean House of Leinster Street, from my way from the campus to the train station, without appreciating its contribution to the Georgian streetscape of Maynooth. The name Harbour House indicates the connection of this house with Duke’s Harbour and the Royal Canal. Work on this major project began in 1790 and lasted 27 years before finally reaching the Shannon in 1817, at a total cost of £1,421,954. Building was unexpectedly expensive, and the project was riven with problems, so that in 1794 the Royal Canal Company was declared bankrupt. William FitzGerald (1749-1804), 2nd Duke of Leinster and elder brother of the 1798 leader Lord Edward FitzGerald, was a leading member of the board of the company building the Royal Canal and a major investor. He insisted that the new waterway would take in Maynooth, and the builders had to deviate from the planned route. This diversion required building a ‘deep sinking’ between Blanchardstown and Clonsilla, and called for building the Ryewater Aqueduct at Leixlip. Harbour House, which takes its name from Duke’s Harbour, is also known as Bean House. This is a terraced, five-bay, two-storey house, built ca 1760 over a raised basement house. This was first built as a detached house, and it is possible to imagine how much more elegant it was than its present appearance. The house was built on a symmetrical plan with its round-headed door opening at the centre approached by flight of ten stone steps that has cast-iron railings. At the main door, the cut-stone Gibbsian surround is painted and has a keystone. The original door was replaced with a timber panelled door around 1990, but the original overlight has been retained. The roughcast walls are unpainted. There is a cut-stone stringcourse to the basement, and there are square-headed window openings and stone sills. Around 1990, the original windows in the house were replaced with uPVC casement windows. The house is set back from the line of the road on Leinster Street, and sections of the original cast-iron railings can be seen at the forecourt. It has a gable-ended roof with slate, clay ridge tiles and roughcast chimney stacks, and cast-iron rainwater goods on the eaves course. The house has an attached, three-bay, two-storey outbuilding to the right, on the south-east side of the house. This was also built ca 1760, and has a square-headed integral carriageway on the left ground floor, and a gable-ended roof with slate. 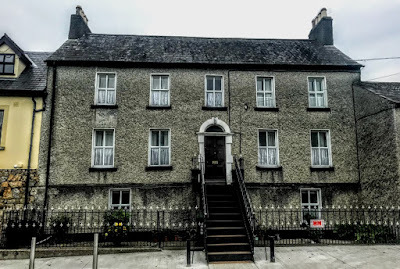 Harbour House or Bean House is an attractive and imposing substantial residence that is of social and historical importance, representing the early development of the suburbs of Maynooth. The scale and massing of the house, together with the fine detailing that includes the attractive Gibbsian doorcase, suggest that the house was originally built by a patron of high status in the locality. Although the house was renovated in the 1990s, the replacement windows are not attractive. Yet this house and its complementary outbuilding retain most of their original form and character and they remain an attractive feature on Leinster Street and an integral part of Georgian Maynooth.